Another day, another blog post? Yes, I am blogging almost two days in a row. That's what happens when I have so many beautiful polishes to be swatched. Don't worry my lovelies I shall get to you all! 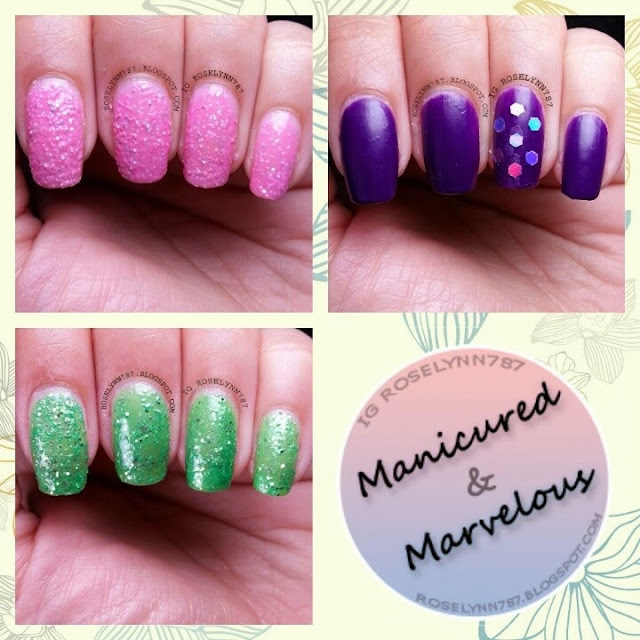 Today I have for you guys three fabulous indie colors from Polished Colors. I was so pleasantly surprised when Tasha asked me to review her indies, I had my eyes on them for months! I won't babble any longer and let these babies talk for themselves. First up, Luck of the Irish, which is a bright green texture-sand polish filled with gold and silver glitters. Luck of the Irish is so eye-catching! It is a texture polish and as such the application is a bit thick. I added a tiny bit of thinner and it helped. But like all texture polishes, it requires thin coats. Luck of the Irish is sheer in one coat and full opacity can be achieved in three thin coats. Swatched in three thin coats with no topcoat. For those who are unaware, texture polishes do not need a topcoat - it actually diminishes some of the texture effect. Very nice addition of the glitters to the texture effect. I definitely recommend this one ladies. And don't let the name slow you down either, this polish is perfect for Halloween or even Christmas. Next we have Pretty in Pink, a cutesy bubblegum pink texture-sand polish filled with silver glitters. I absolutely love the texture in this bubblegum beauty. Swatched in three coats and no topcoat was added. Pretty in Pink is best with two to three coats for complete opacity and full texture effect. I like the silver glitters added to this polish, I feel it brings out the texture a little bit more. 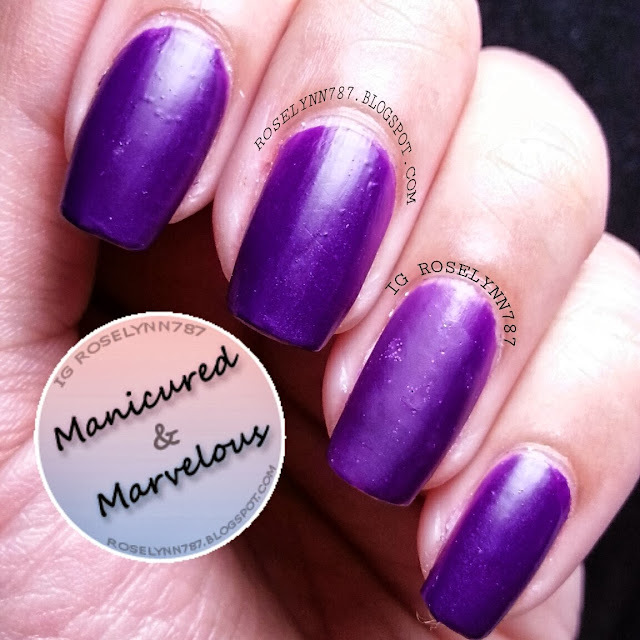 And last but certainly not least we have Purple Passion, a royal purple polish that dries to a beautiful matte finish. Purple Passion has got to be the perfect name to accompany this polish. 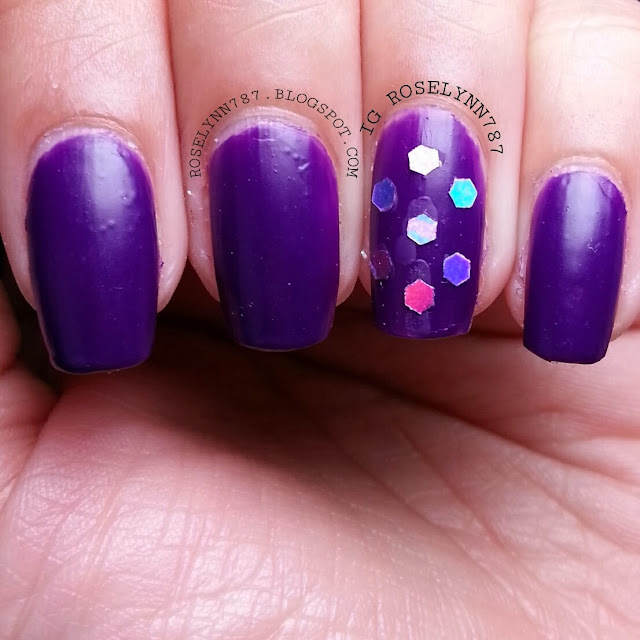 The shade of purple is so dark and rich, the matte finish only adds to the color. The application was very nice and easy, no thickness or goop. The first coat is a bit streaky but additional coats to enhance opacity quickly fix this. Purple Passion is sheer in one coat but full opacity can be achieved in two to three thin coats. Swatched in three coats and no additional top coat was used. Adding this beauty to my favorite polishes of all time list! I was seriously sitting here writing this review while drooling over how amazing my nails look with this polish on. The cute loose glitter in the second picture was also provided to me by Tasha, thank you so much! Overall I am very pleased with Polished Colors! Purple Passion is just absolutely to die-for, so you got me sold with that one. Definitely one of the best purples in my collection. Of course, if texture polishes are your cup of tea, then you'll definitely enjoy the sand-texture polished from Polished Colors. Pretty, cute, and nice application. These textures have glitter in them making them extremely eye-catching. These are only three of the many many polishes offered by Polished Colors. She has a amazing variety available on her website and also takes custom orders. Take a minute and check out Polished Colors, you can also find her on Facebook and Instagram.